A (3/3): A light red almost peach colored hazy beer. Tiny curtains of bubbles rise from the glass creating the soft creamy head that leaves behind minimal lacing as it's drank down. S (8/12): The aroma that comes off this glass is very fruity with a slight horse blanket character. Cranberry is definitely present and may do a bit to overpower the blueberry. T (12/20): Flavored with a blueberry and cranberry puree this beer was more tart than I was expecting. The cranberries really give it a tang that only a cranberry could. An alternating dance of blueberry sweetness and residual tanic bite from the cranberries fight for sensory superiority. M (4/5): A medium bodied beer with a lively carbonation level and a biting finish. Some residual sweetness is there, but a definite tanic character presents itself after swallowed. O (7/10): Probably not my favorite iteration of Stumptown Tart but overall a very enjoyable beer. The cranberry tartness and pucker stays with you for quite some time after drinking. 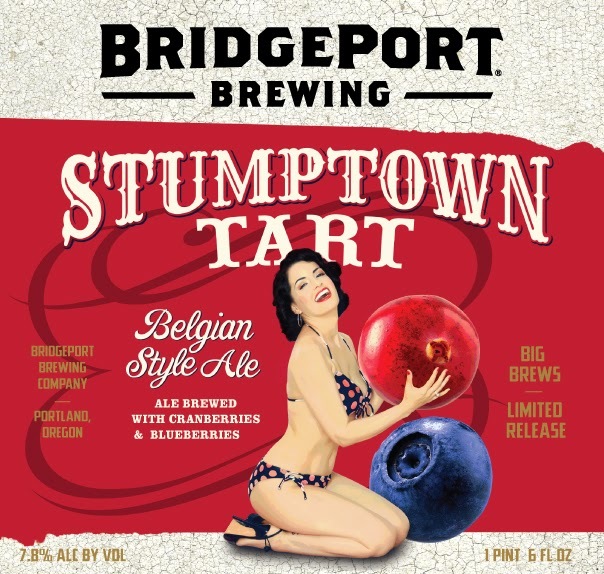 UNRELATED RANDOM OBSERVATION: The Stumptown tart bottle was a little more risque than in years past, sporting a two piece swimsuit instead of the more conservative full coverage pinup outfits of years past. Although 2011 Strawberry was also in a two piece suit, this year exposes a little more mid-drift, but as always the pinup style artwork is fantastic.